Pioneers in the industry, we offer uv high gloss kitchen and smart kitchen from India. 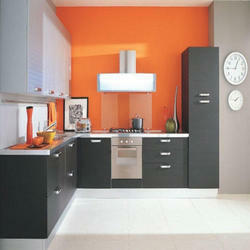 By keeping track with the market development, we are indulged in offering an exclusive array of UV High Gloss Kitchen. Our offered high gloss kitchens are designs as per the requirements of customers using best grade of wood and steel. This range of high gloss kitchens is provided in several custom designs on demand. Moreover, our customers can avail this range at a very nominal price from us. We are recognized as the leading manufacturer, wholesaler, trader and supplier of Smart Kitchen. The offered smart kitchen is designed as per the latest designs by our skilled workforce using finest wood & plywood. Our smart kitchen is available in various designs and customizes options. The offered smart kitchen is widely applauded among customers for its less maintenance. Looking for Smart Kitchen ?